Organizers of an all First Nations sports event in B.C. are being accused of racism and discrimination for benching a status Indian player who is black. I think he should get himself a lawyer. They let him play before. Agreed. This is an unfortunate situation in my opinion. If the ANBT don’t reinstate Josiah soon, it could become a fatal mistake for the organisation. [quote]B.C. 's representative for children and youth says that under Canadian law, Josiah Wilson must be allowed to compete in a First Nations sports event that excluded him, and if he isn’t, future funding for the tournament could be in jeopardy. B.C. 's representative for children and youth says All Native sports event has a legal obligation to reinstate an excluded black status Indian player. Which committee members voted to exclude him? Publish their names. They are breaking the Douchebag Limitation Act of 1957. They do this by committee so they don’t have to take personal responsibility for being horrible human beings, and instead can blame the 'nameless committee." CBC published the letter he received. It is signed by Willis Parnell, who is the Chair of the Rules Committee. It mentions Peter Haugan as well. So there are two names for you to run with. “In the earlier days there was a lot of resentment from all the aboriginal people coming in from the villages,” said Rudy Kelly, a former sports reporter from the Lax Kw’alaams First Nation. He said changing attitudes, combined with the realization of how much income the tournament brings to the community, led the event to be viewed in favour. “Racism hasn’t quite gone away, but it was a lot worse back then, a lot more blatant,” said Kelly. It would be almost funny, if it weren’t so sad. 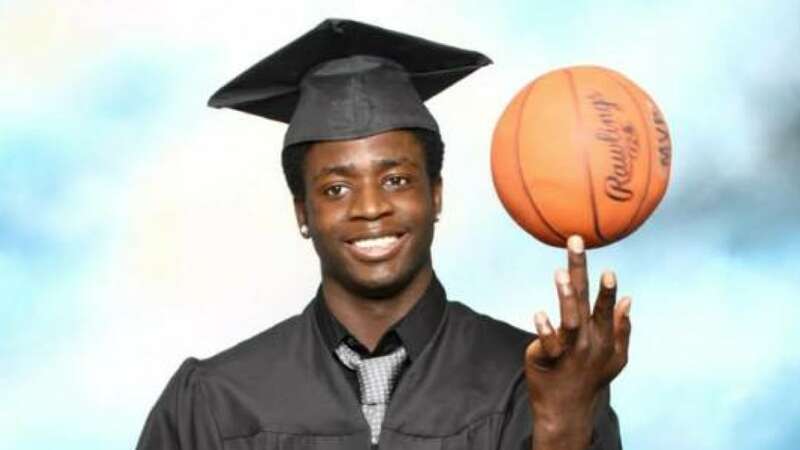 A young Calgary man says a First Nations basketball organization’s decision to bar him from a tournament in northern British Columbia is discriminatory. Josiah Wilson, 22, said he is a status Indian who was adopted from Haiti as a baby and is a member of the Heiltsuk Nation in Bella Bella, B.C. 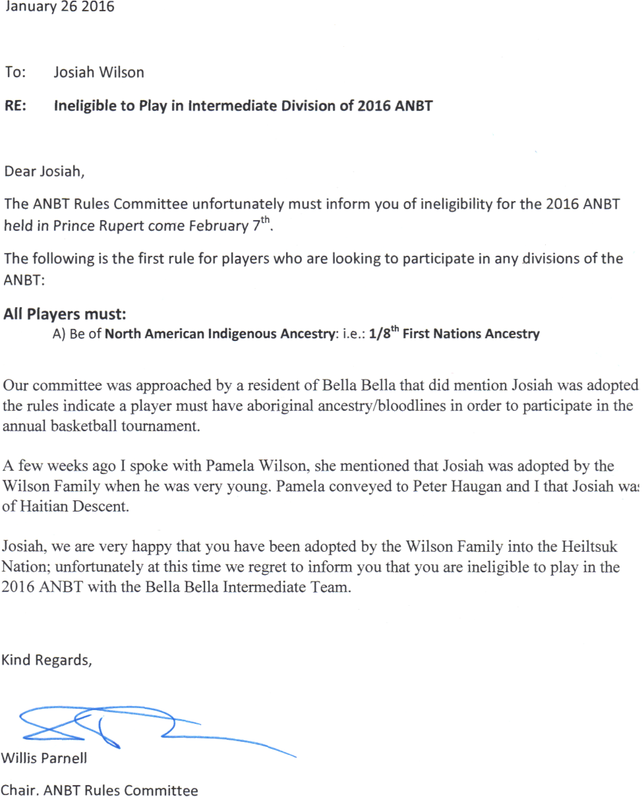 Wilson said he played for a junior aboriginal team for two years and was about to enter his third All Native Basketball Tournament with an intermediate men’s team this week but was told he could no longer play. This is straight up racial discrimination…horrible. This guy is a status Indian adopted into a native family, he has just a much right as anyone else to play in that tournament. playing devil’s advocate here I understand why the would ban someone if the rules themselves state they have to be at least 1/8 aboriginal blood, even if they do have a status card, but if the person played at the tournament before then it is wrong to ban him, my question is, who is the dipshit that called into question his status? was a certain team scared of losing to his team? Just because something is in the rules, doesn’t mean the rules themselves can’t be challenged. Any time I see the words racial profiling I shudder. There is no excuse for this. I feel that this whole tournament is discriminating. In this day and age they should have players of every race not just status Indians with aboriginal blood. I really admire the whole story behind the tournament but this should not be a race thing anymore. Keep the whole First Nation theme, with all the great food, and ceremonies, keeping the tradition, but just get rid of the only native approach. It would probably even benifit the tournament bringing even more sponsor from local companies and non local companies. Mr. Wilson, who says he’s skilled at his sport, chuckled at the suggestion that organizers might mistakenly believe his race gives him an advantage on the basketball court, saying he’s heard similar speculation from friends. I had a look at the February 17th edition of the Northern View and I didn’t see any mention of this story. Did I miss the story in an earlier edition? The Globe and Mail covered this story. "While his status as an Indian under the Indian Act is an important fact, I worry that it is being used as the ultimately proof of Josiah Wilson's belonging. It’s as if Heiltsuk citizenship law is not enough," says Damien Lee. The media attention given to Wilson’s story is a good thing. It is raising important questions about how indigeneity in Canada is defined, by whom, and whether adoption is valid grounds for indigenous peoples to claim individuals as citizens of their nations. The determining factor for who plays should be if you have legal status as a First Nations person – not the colour of your skin or whether you joined your family through biology or adoption. I’ve been playing basketball since I was four years old, when I used to dunk on my little plastic hoop. I played on the junior high and high school teams at my francophone school, La Rose Sauvage in Calgary. My team won provincials in 2013. I played twice in the Junior All Native and twice in the All Native Tournament for the Heiltsuk Nation. Basketball has been my passion since day one. Basketball is life. The media attention given to Wilson’s story is a good thing. I agree! I am disappointed that our local paper decided to avoid this story. why don’t they out the person or persons that protested his status so as to get him banned from playing? let those ppl try to defend themselves. Scroll up and you’ll see who complained and who made the decision.